ONTRAPORT now has a drag-and-drop pipeline view for managing your contact relationships throughout funnels. 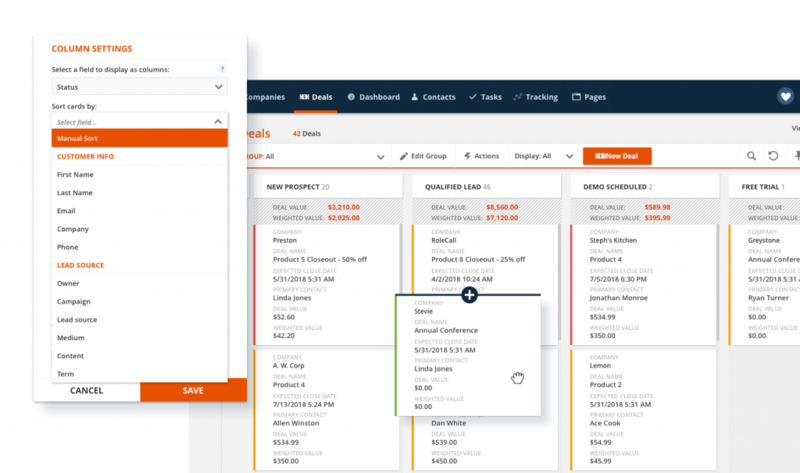 ONTRAPORT’s CRM is now visual. 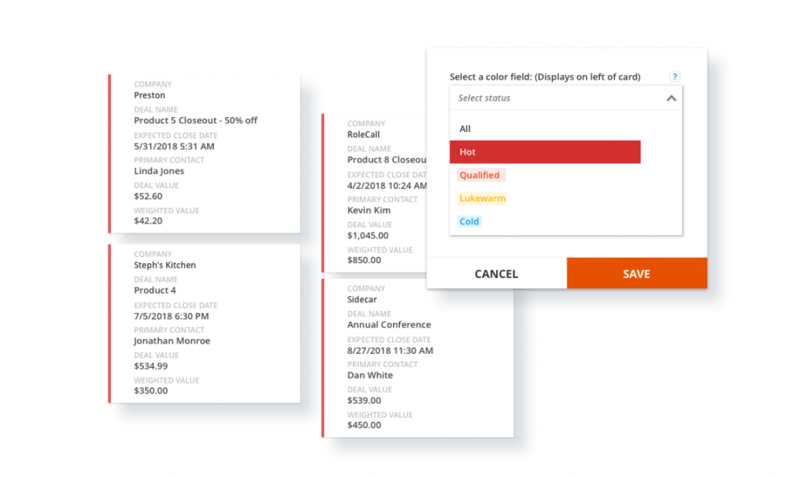 Our new Card View display allows you to create completely customizable visual pipelines so you can immediately see what’s happening to every contact in every process in your business. 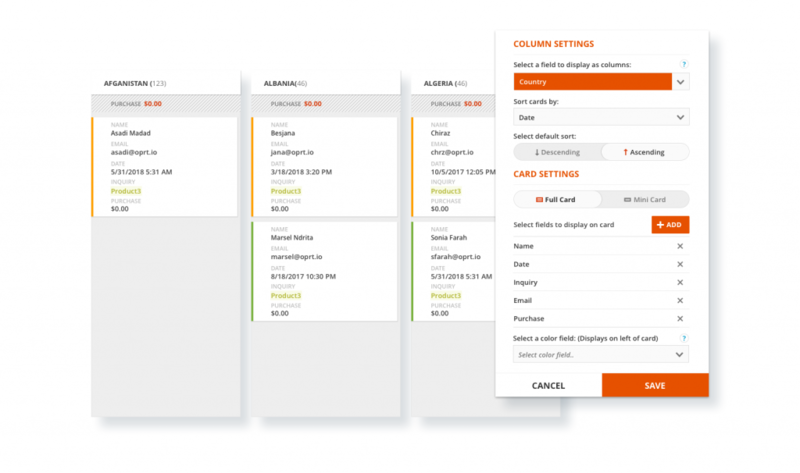 In Card View, each contact’s information is displayed like a business card, showing only what you want to see at a glance, and the cards are sorted into columns representing stages within any process. ONTRAPORT has always been the ultimate platform for building automated systems in your business. Now it’s easier to visualize them. This birdseye view, available in the Contacts and Custom Objects collections in addition to the current “list” view, is much more than just a facelift; combined with the power of ONTRAPORT’s marketing automation, you can use this view in actionable ways to improve the way you manage customer relationships. 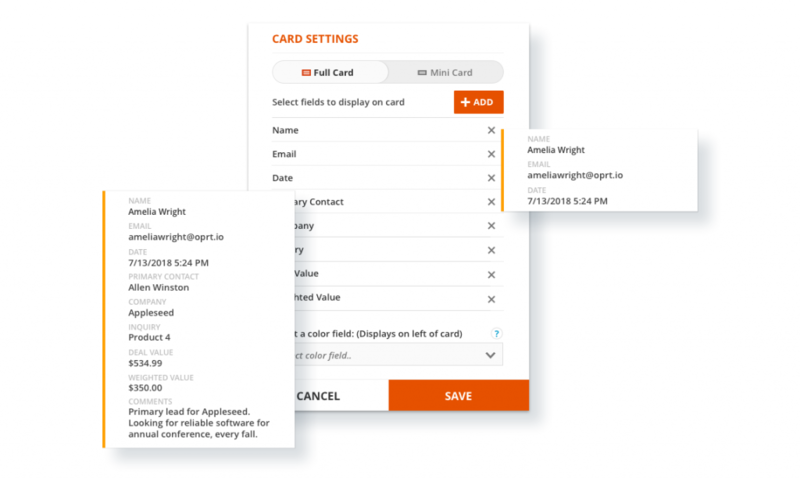 You can interact with the cards in Card View using simple drag-and-drop functionality, making it especially useful for businesses with live sales teams or any team members who personally connect with customers. These team members can manually move contact cards to appropriate next steps in the funnel based on their conversations with the contacts or other intel. Moving a contact’s card to a new column updates the related field in his or her contact record and can trigger any corresponding automation; the columns in Card View are equivalent to field values in a contact record. Team members using Card View can also easily select certain contacts or groups of contacts and send them an email or SMS, add them to a specific campaign, or label them with a particular tag or field value using group actions just as they could in list view. “Card View gives team members confidence that they’re staying on top of their tasks and allows them to take ownership over advancing their relationships with contacts,” Landon said. Using Card View as their central command center for their day-to-day work, team members can quickly prioritize which contacts to follow up with based on visual cues, dictate and ensure follow up with each contact, and gauge their progress toward their quotas and goals at any time. From a management perspective, the ability to get a pulse on the quantity or type of contacts in each stage of your critical systems at any time gives you insight for making data-driven decisions. You can more easily forecast results for budgeting and resource planning, spot weak points in your funnel to make improvements, and zero in on your team’s greatest opportunities to convert leads into customers or otherwise achieve your goals. Visual contact management has previously been used mainly for pre-set stages of a sales pipeline, such as “qualified lead,” “demo scheduled,” “considering purchase,” “committed to purchase,” and “purchased.” However, with ONTRAPORT, you have the flexibility to customize your view to depict any system in your business. New client onboarding: If you have an onboarding process to ensure new clients are properly welcomed and trained on your product, you could organize your Card View stages based on the steps involved, such as “welcome call scheduled,” “welcome call completed,” “training video 1 completed,” “30-day check-in email sent,” and so on. This way you can easily spot where clients get delayed and quickly tweak your outreach messaging approach to free up the flow. New product lauching: Say you’ve got a campaign to create buzz around a new product; you can use Card View to gauge how effective your efforts are by dividing contacts into stages of the funnel. For example, you could designate stages for “signed up for pitch webinar,” “attended pitch webinar,” “visited order page,” and “purchased.” This can be a useful way to estimate your conversion rates and revenues. 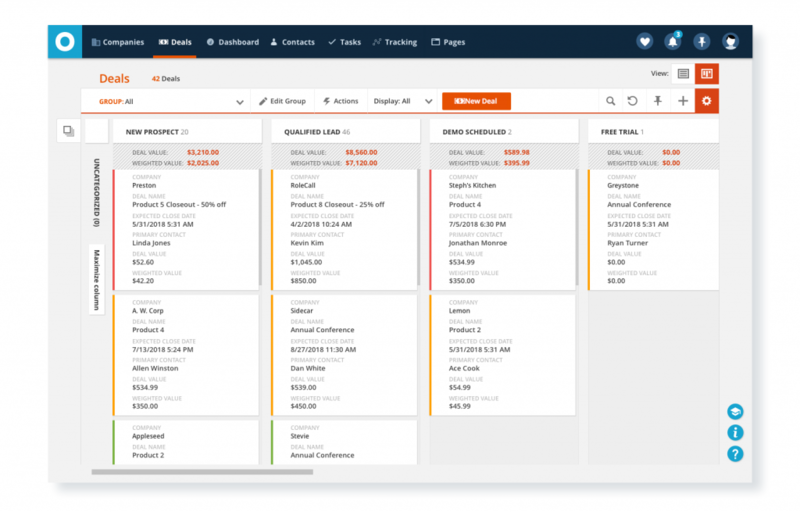 Client project management: If you’re a B2B service provider, you could use Card View for the stages of repetitive client projects, such as “proposal sent,” “proposal accepted,” “stage 1 complete,” “invoice sent,” “invoice paid,” and so on. This can be especially helpful with keeping track of the status of your interactions and ensuring you don’t miss an important approval or payment. With ONTRAPORT’s Card View you have full control over what stages you want to show, what information shows up on each contact card, and how each user in your account views the funnel. The stages you organize your contacts into or, in other words, the labels that show at the top of each column in Card View, can be based on any field in your contact records. The values in the dropdown for that field become the labels for each column. For example, if you have a “lead status” field with dropdown values such as “new lead,” “considering purchase,” and “completed purchase,” those values will become your columns in Card View. When working in Card View, you can view full cards with more information or mini cards with just the essentials so that you can see more cards on one screen. In your settings, you can choose exactly which fields from your contact records you want shown in both the full and mini card views. You can also set up a new color field to automatically add color bars to the side of cards based on settings you dictate. The colors serve as additional visual cues to support you and your team in quickly understanding the status of contacts. For example, you can use green, yellow and red to indicate the amount of time that has passed without a lead being contacted. Red could signal that it’s been over a certain period of time, immediately cueing your team member to prioritize contacting that lead before the others. View settings are saved on a per-user, per-group basis. That means that every user in your account can create specific views that matter to him or her. For example, sales reps could show contacts they’re assigned to, and a marketing manager could filter to only show contacts who came from a certain lead source. If you’ve set a particular group to be displayed as cards, the system will remember that and display your data just the way you left it the next time you view that group. This allows every user to easily create and quickly access custom views of your pipelines. For example, you may want to have one view of your new leads sorted by deal size and another that shows you which leads have been active on your site most recently. The possibilities are unlimited. All ONTRAPORT users can now access Card View simply by selecting the icon while in the Contacts or Custom Objects collections. For detailed instructions on how to set up and use Card View, visit the Knowledge Base article here. Stay tuned for additional Card View updates that will facilitate even quicker workflows and accommodate the needs of sales teams even more comprehensively.